If you have picky eaters, this recipe is usually a win. My husband thinks he doesn't eat mushrooms yet he loves this dish. I use my food processor to finely chop the mushrooms and kale, plus it cuts down the cooking time. 1. Heat oil in a skillet over medium heat. Add the garlic, ginger and ground chicken and cook about 3-5 minutes until chicken is partially cooked through. 2. Add mushrooms, kale and scallions. Cook for about 2-4 minutes, then add hoisin, soy sauce, oyster sauce, rice vinegar, honey and corn starch. 3. Bring sauce to a boil and cook until sauce thickens and ground chicken is cooked through. Season to taste. Remove from heat and toss in cilantro. 4. 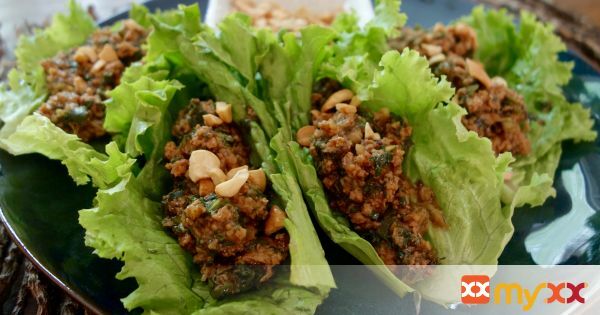 Spoon lettuce mixture on to lettuce leaves and sprinkle with cashews.